Primer kit for your carburetor. Starting the engine of your personal watercraft is never a problem with our carburetor primer kit. Comes with all brass fittings, Pro plunger, spigot and plug. Get rid of that worthless factory choke and apply a direct shot of fuel. 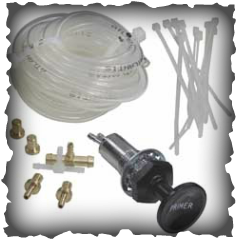 This carburetor primer kit will increase flow which in turn makes more power. Fits the Mikuni and Keihin carburetor.